"Bloom" is a set of three images that will come to you in six files. Why six files? 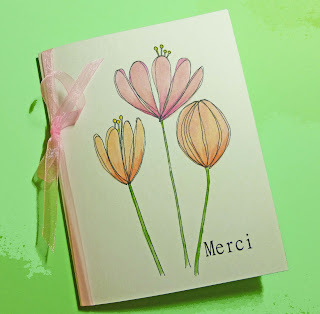 Three of the blooms are very light and will print in a softer value. I used the lighter set for this delicate watercolor wash. 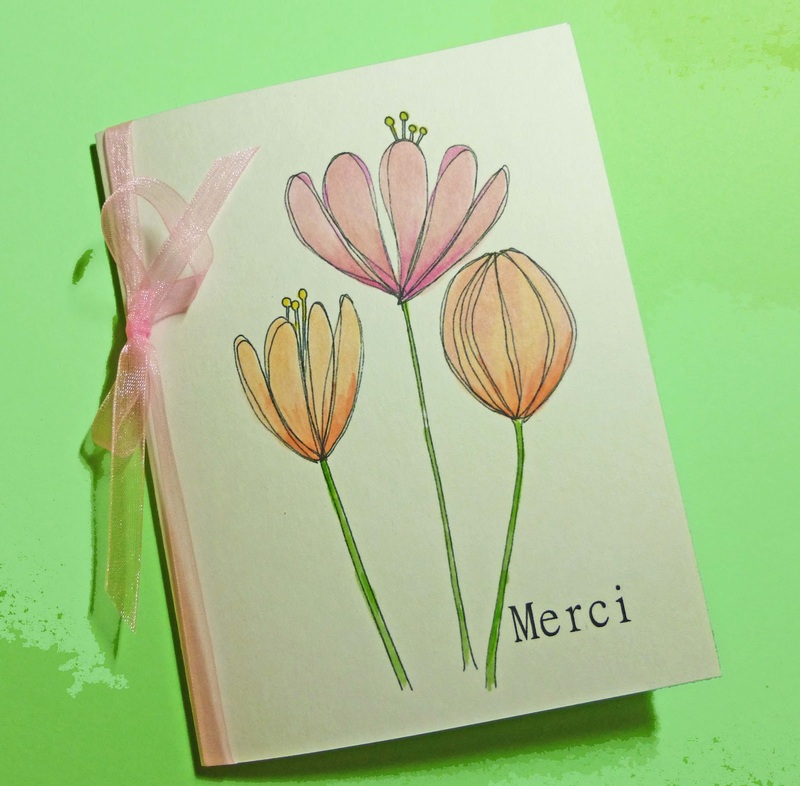 I arranged the three Bloom images and inserted a borderless text box to type "Merci." Using a water brush, it took under a couple of minutes to add some light watercolor washes, and tie with a bow. 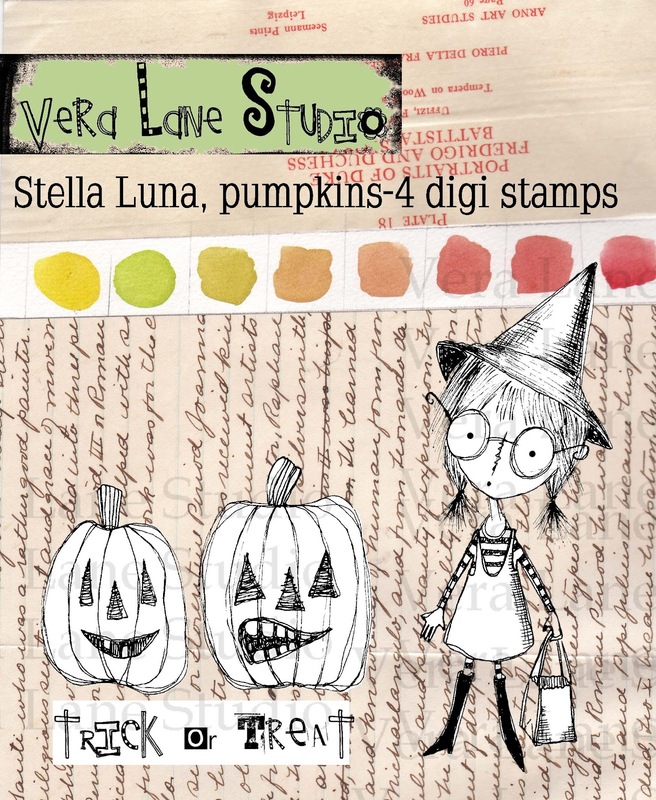 Stella Luna is a set of four digi stamps. I would love to show you a sample, however, my dog ate it. (True story) She's really quite cute, and I wanted to get her in the shop before we hit October. 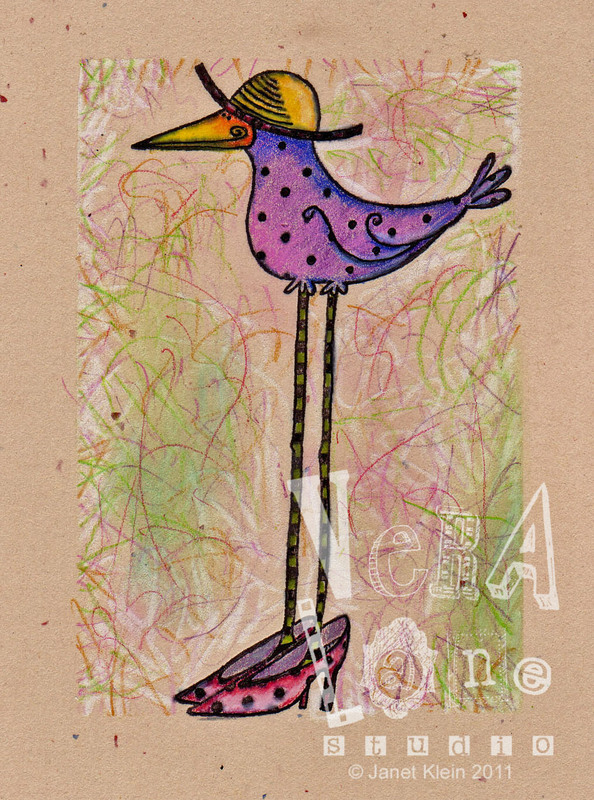 Today I have two bird images to share with you, one is a digi stamp, and one is in rubber! Both images will give you a smile. 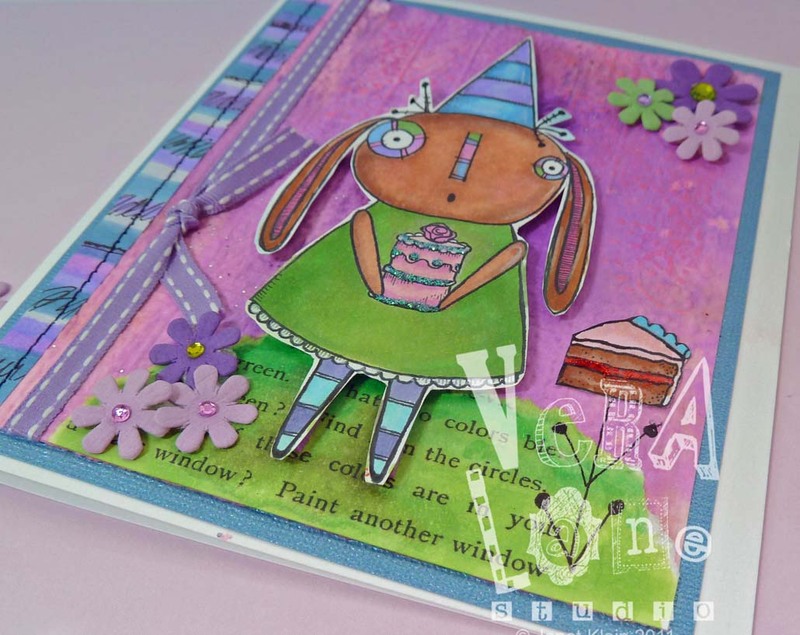 Magnolia is a very versitile digi stamp, she comes with two additional images for you to manipulate in your card and paper crafts. This image can be stretched for a tall card or pulled to create a shorter and chubby bird. Magnolia's pusre can be small or stretched to create more of a shopping or oversized bag. 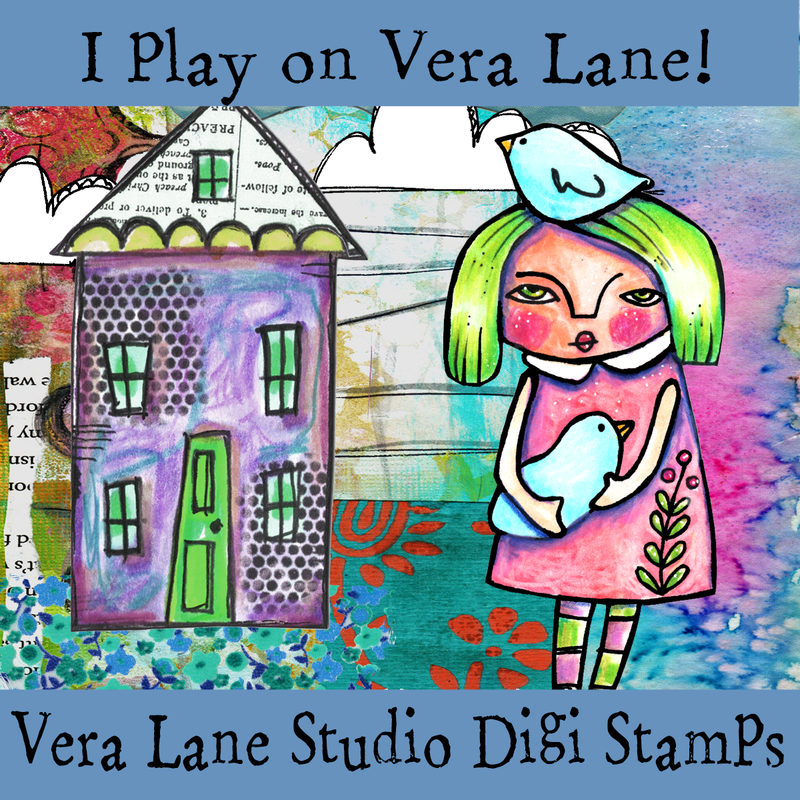 If you enjoy using digi images, please stop by Vera Lane Studio's Etsy shop. If you prefer stamping in rubber, you may want to check out two sizes offered of "Bird Legs" from Stampotique. She has lots of character, with a little more serious feel than Magnolia. Stamp or print - today is for the birds. I’m procrastinating a bit this morning. I should have gone to the gym but I found myself in my studio, imagine that? 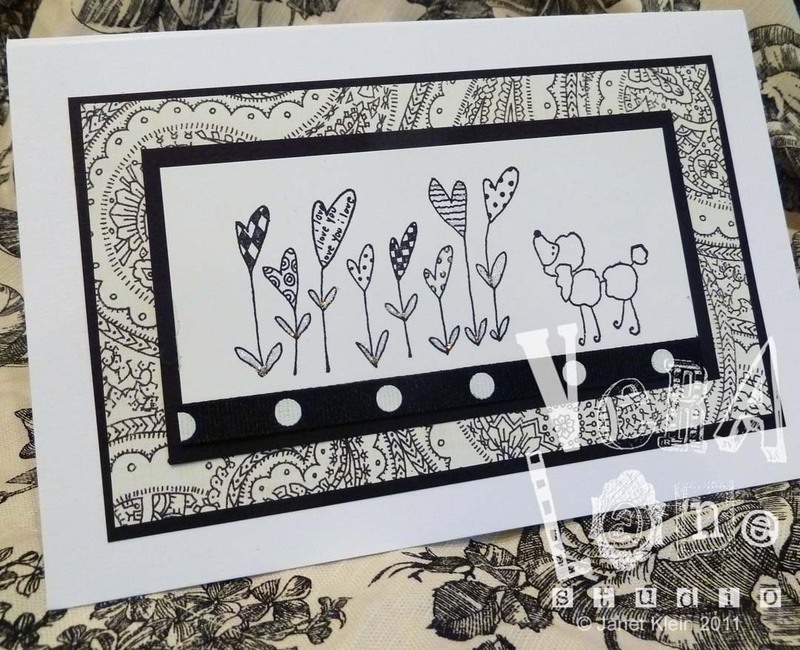 I came up with this fast little card, combining a digi stamp and two rubber stamps. I rarely know what I’m going to do once I get here. 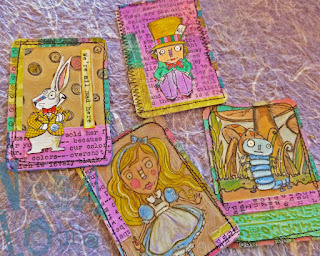 I have cigar boxes with card starts, random scraps glued to a surface, painted borders, partially stamped images, etc. These are things I would put out for my students in free time, and it was amazing to watch what the children would come up with. My advice to the kids, was to let the paper choice guide you to your coloring. So today, I found this embossed white cardstock with a scrap glued in the center. This was going to be my base. 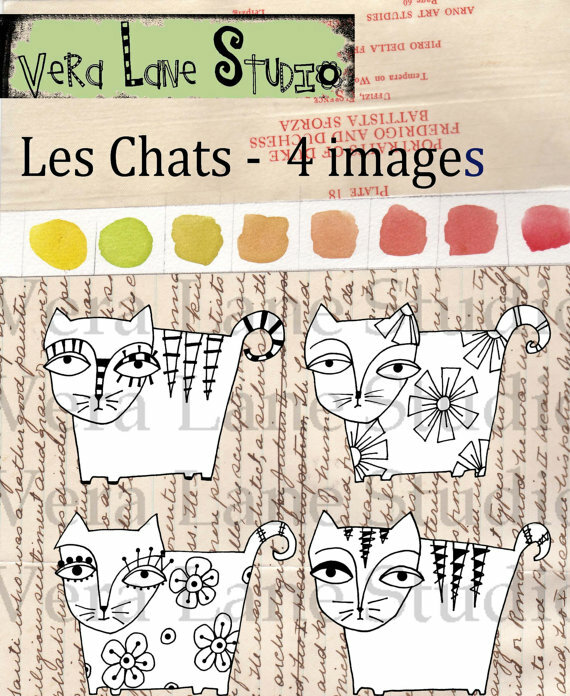 I had one of my ‘Les Chats” digi images already cut. Using Copics, I pulled some pink form the scrap and added a little accent of green. I love how the white stays so crisp so I left the cat’s body white. I decided on a landscape format and attached the cat asymmetrically. At this point I am floating the flower element and it is unbalanced. It needs a stem, and for my eyes, it needed color with some black contrast to pull over the cat image. Does that make sense? Since the cat is outlined in the black I need to visually balance the composition. 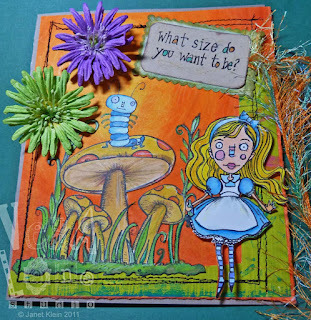 The perfect stem is the Ribbon Border #3 from Stampotique. No need to introduce anymore colors, just repeat the colors in the cat image. 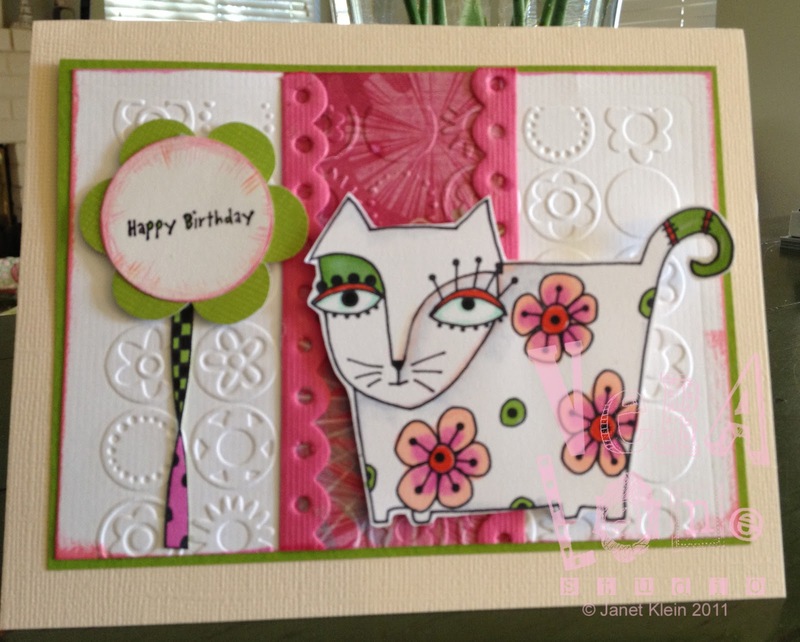 To begin with boxes of scraps, it is a fast way to create a spontaneous card or little work of art. This approach is really great fun for the kids. Creating that composition, using balancing skills and making choices about shape, texture, and color, taps into those thinking skills. While my specialty has been working with children, I hope some of the process will inspire you too. Tip: When printing your digi image, create an entire page and use the sizing handles to alter the sizes. Rotate the images so you can fit as many as possible on your sheet -- then print on cardstock. Cut them out and set them aside for later use. One of my favorite quotes is from artist Joan Miro. "The simplest things give me ideas." How true. And I like keeping it simple. 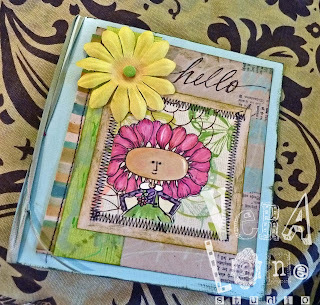 Here is a simple tag tutorial for the beginner stamper or just for a little creative pick-me-up. Select a scrap of paper and trim to create edge of tag. Glue in place. 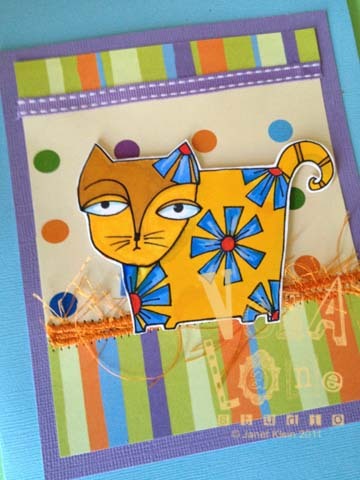 For an option add an additional layer of paper and or ribbon. Stamp an image on the tag. Use the paper to guide you in color choice, add a pop of contrast or keep it monochromatic. Punch a hole in the top center of tag, add grommet and color coordinated ribbon. These can be further embellished but just sweet and simple as is. 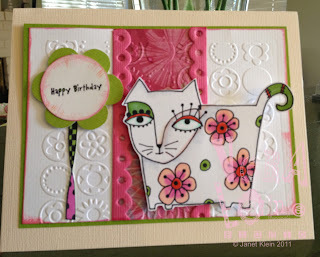 If you want to “upcycle” repurpose the inside cover of greeting cards for your white cardstock. Make a stack of cards and set the materials out for the kids. Decoupage a little box to store your homemade tags or package to give as a gift. Simple? Quite! As good as I am about multi-tasking; blogging has slipped the “to-do” list. My mother’s health rapidly declined since my last post and we lost her at the end of March. I think my Dad was tired of waiting for her as she passed the day before his birthday. So I hope they are now guiding me and encouraging me to do the things I love to do. I never liked to color coloring books as a child, but I did enjoy LOOKING at them. I always loved the contrast of the black line – how clean it was against the light cream page. I liked whales, Chilly Willy, so the whole black and white thing is a childhood issue for me. And there is nothing wrong with that. Maybe that is why I prefer to draw with an inked line rather than color and embellish. Do I own color? Yes, I am obsessed with collecting color. From Copics to Lyra pencils, from Caran D’ Ache Neoart to Crayolas, paints, and pastels, chalks, and inks – I have them all. Paper? Another obsession, but give me a handful of Pitt pens in jet black and I am a happy one. 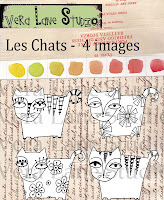 My recent black line play has led to the “Les Chats” collection. Meet Luce, Luc, Marcel and Francoise. I’m sure there are wonderful things that can be created with this quarto of kitties with colorful imaginations. For now, I’m going to keep doodling and see what pours out of my pen. 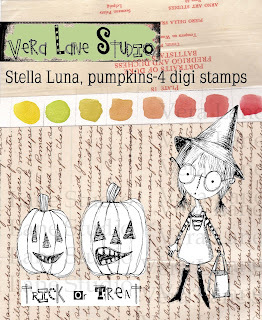 Welcome to our blog hop introducing a new artist as well as many new stamps from myself and other artists. You should have hopped here from Joanne Wardle. If you did not come from Joanne Wardle blog, you will want to start at the Stampotique Designer's Blog. Join us along the blog hop for a chance to win some new stamps as a random winner will be chosen from one of the designer blogs as well as one from our Stampotique blog, so make sure to jump through the hop and leave a comment here when you are finished. Let us know what your favorite new stamps are. We will announce the random winners on our next challenge on 2/22/12 so you have a week to hop around. Kira Nichols came up with. 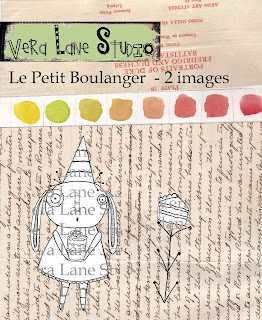 "La Petit Boulanger" has arrived in my Etsy shop! She's been on the drawing table for some time, but I have finally managed to make a sample. She's really pretty cute in a funky sort of way. The little cake slice plant is a fun image in itself. I've have made birthday gift tags with that little image alone and it works quite nicely! The background is a watercolor wet on wet technique, when dried it was then embossed. The text image and other decorative elements will arrive in my shop soon. It's not going to be one of those bright and sunny days here in Arizona. A good morning to wake-up and grab a cup of coffee and head to my studio. I have several projects on my table in various stages. The new challenge at CASual Fridays; CFC36: Create a Clean And Simple Project that is only black and white, certainly seemed like a easy place for me to start. This is an honor to “penguins everywhere”…loved “Chilly Willy” as a kid, so I am going for this. The graphic quality of the sharp contrast of black and white has always appealed to me. That’s how I see when I design my stamp images, it is always more of a challenge to use my stamps the way they are meant to be used. 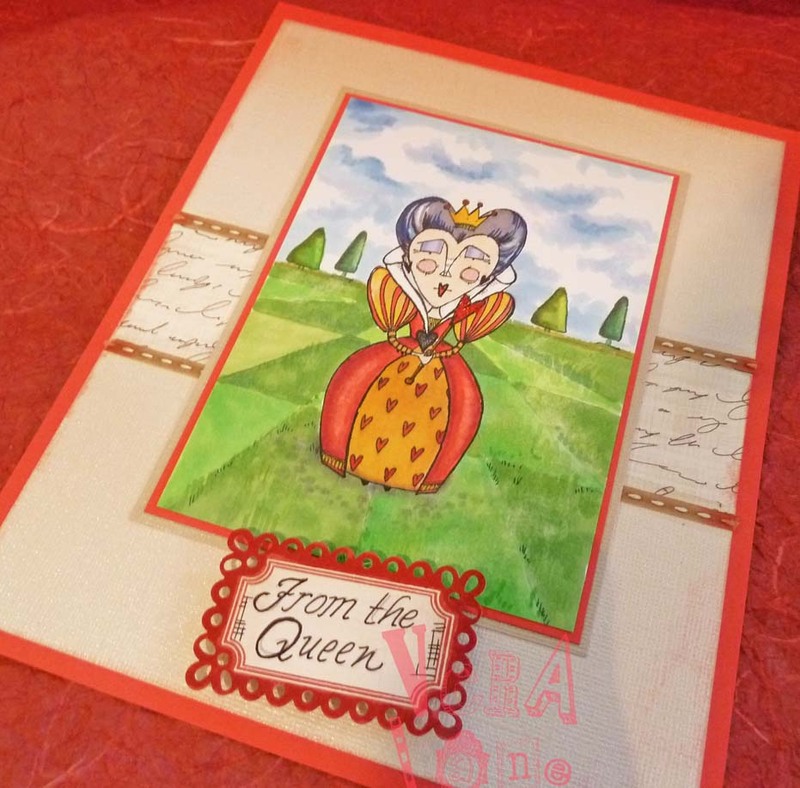 In this submission I am using my Stampotique images Bella and I Love You Flowers. That’s it. Black on white, cropped, layered with b/w papers ribbon scrap. Easy? Yes. One more thing, had to add a dash of Diamond Sticklers, just had to! As I am moving things about I come across a box of scraps (actually, I have lots of boxes of scraps, but I am attempting to appear more organized). I have projects that didn’t work out, color practice, etc. So I decided to repurpose items and put them together to make a card. This is a similar way I have my students work in their collages. I supply them with boxes at each team table and let them go to town. 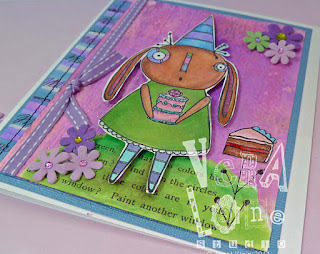 The image is Fleur Gril #3 from my Fleur de Girl collection for Stampotique. She is cropped from the entire image and placed in a scrap frame. The “hello” is from my own hand. The corner needed a touch of black to balance it and I thought “hello” would fit the bill. Now I’m off to a busy day ahead. You don’t mind if I leave my studio a little, well, let’s say, messy? Is that a calendar in your pocket? 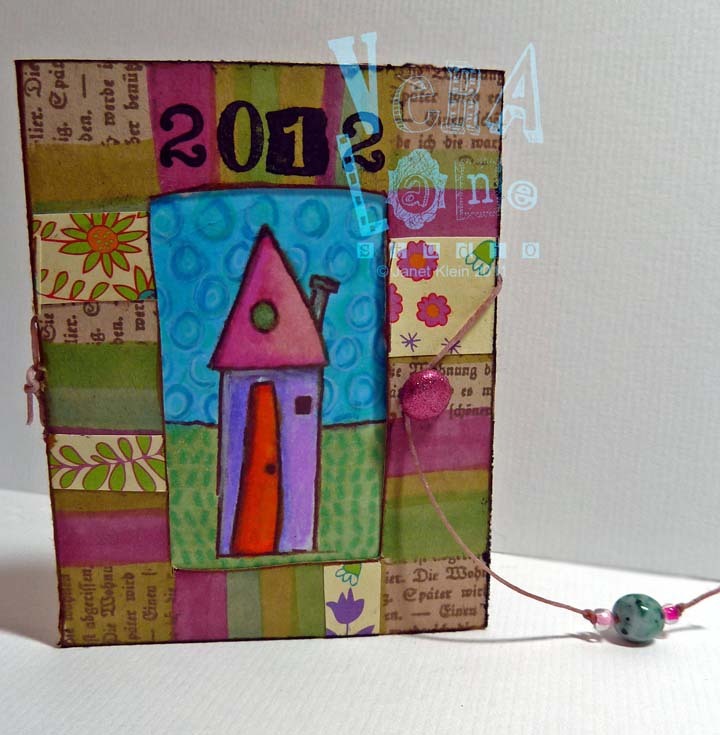 When I saw the Stampotique challenge for a 2012 pocket calendar I immediately tought of an ATC format, inserting montlhy cards into a small portfolio. I like the idea of small – I can manage small projects lately. The image on the portfolio cover is cropped from my row houses for Stampotique. 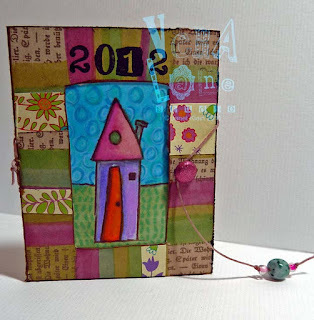 I love this stamp – the imperfect houses are reminiscent of the houses my Kinder and First grade artists draw. I get a lot of inspiration from the children! I used Copics and Prismacolors to color the image. 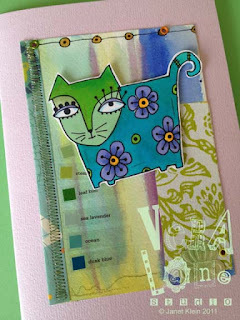 Copics, scraps, and masked stamped text from the colorful border. 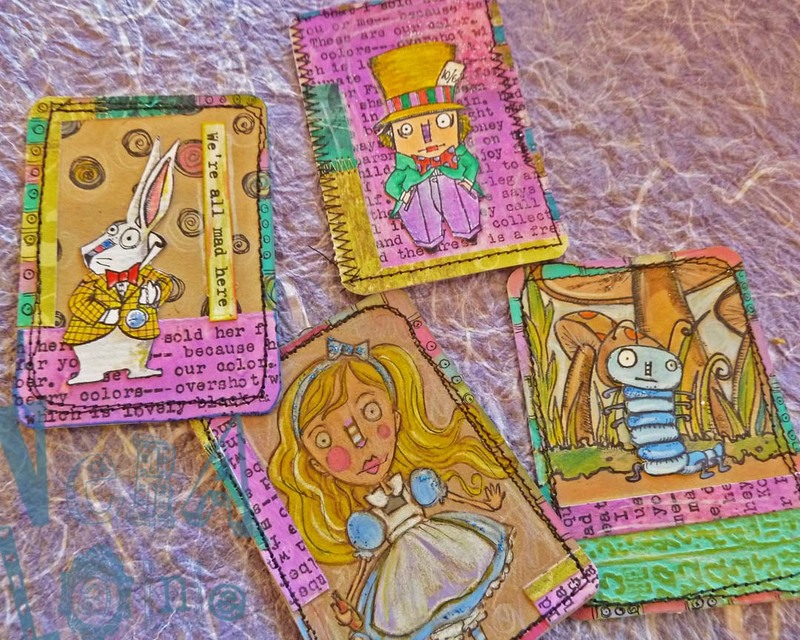 The months are a set by Amy Wilson Wellenstein for Stampotique. 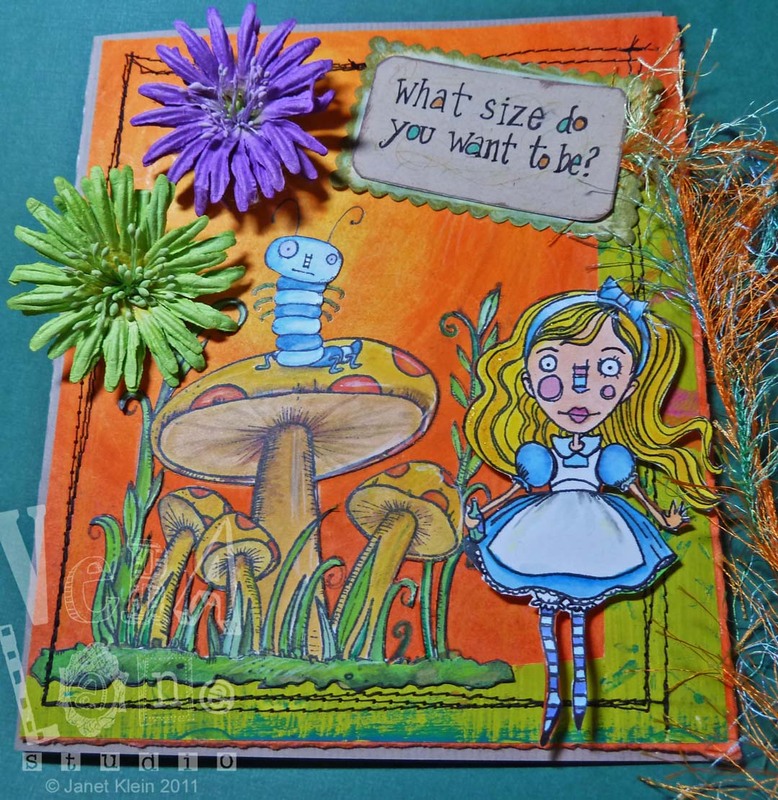 They fit perfectly – I was so glad they did as that was my agenda! 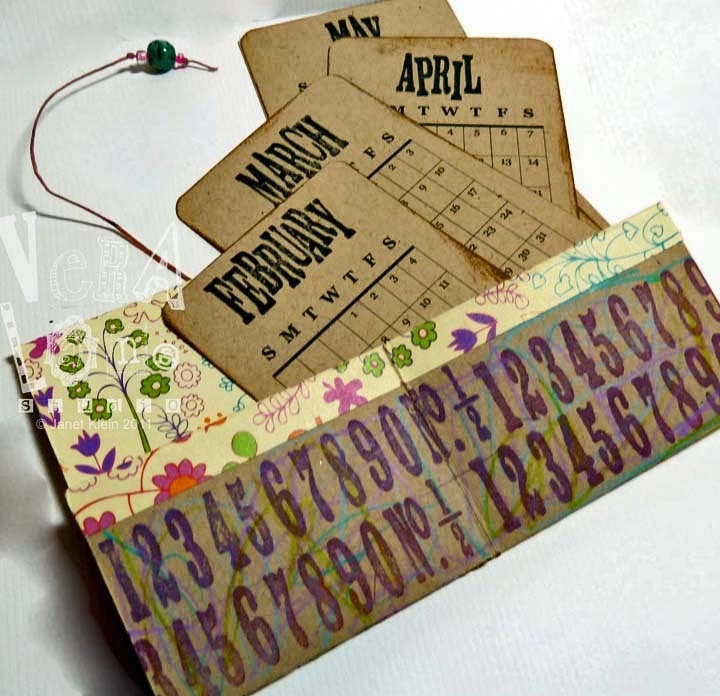 I created the miniture calendar in Publisher, leaving off the months so they could be hand-stamped. The number row on the inside of the portfolio, also by Amy. The 2 1/2" x 3 1/2" portpolio ties with a beaded cord and is secure with a brad. I think an old button would have been a better choice, but the brad was an easier solution! 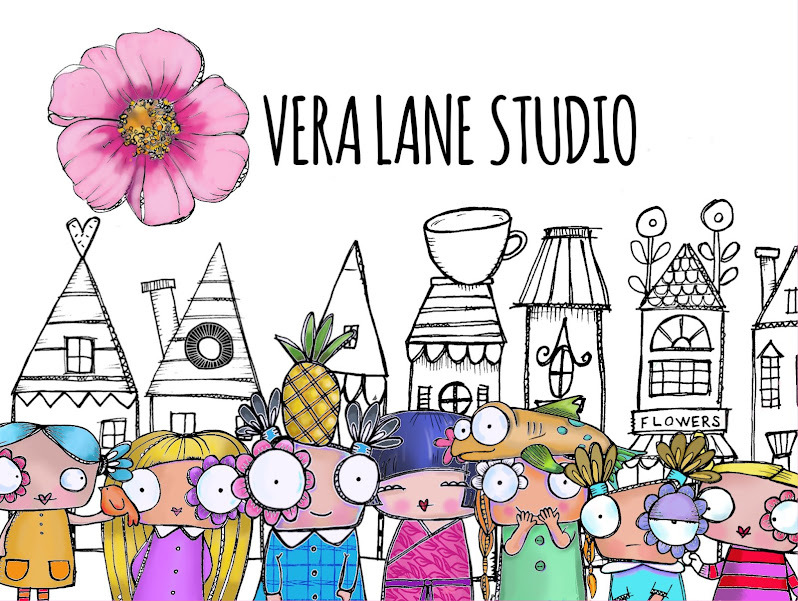 Vera Lane Studio has been my safe haven this week. With thoughts of retirement, an ill parent, and completion of 850 report card grades (two semesters to go) my head has been in a state of "whirl." Although I am surrounded with plenty of inspiration and things to play with, life just seems to get in the way. 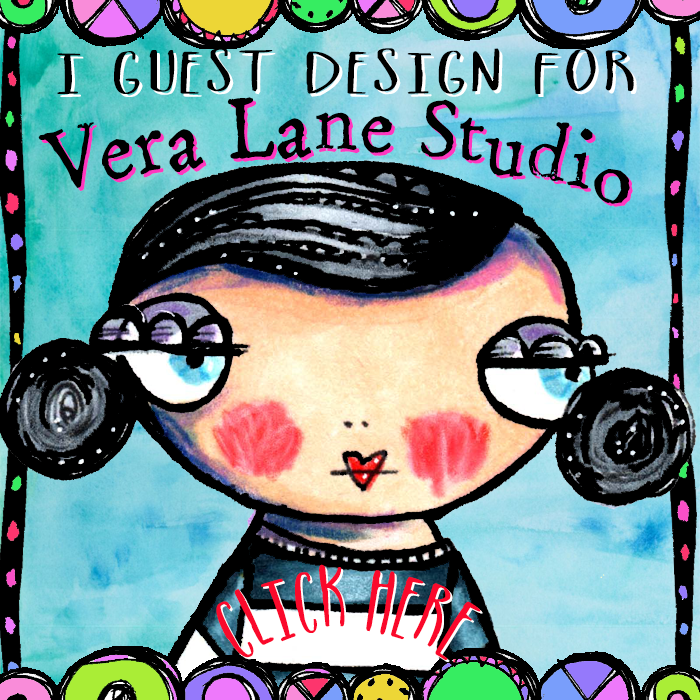 Vera Lane Studio is slowly getting ready for little artists to explore, share, create. Doors will open late summer to early fall. In the meantime, I putter, rearrange, and try to draw when I can. 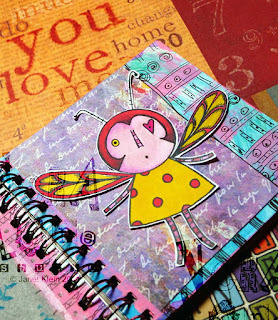 I am really excited about a new image line that I'll have coming out with Stampotique. The company has a variety of outstanding artists with new ones added to the winter catalog. I am happy to be able to add a few images here and there -- there is something about having your art indexed in black on a little block of wood that gives you such a thrill! A simple,happy pleasure. But with all the images floating in my brain, and some perhaps not lending themselves to rubber, I am taking a stab at digis. Plenty of artists are doing them I know, but I hope my own brand of funk and whimsy will be enjoyed by some crafters out there. 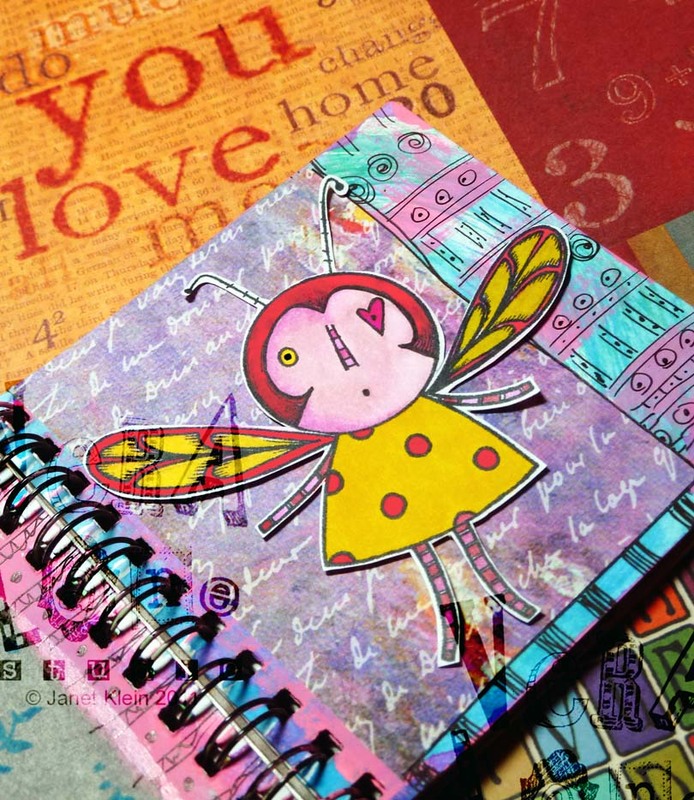 My latest digi posted on the Vera Lane Studio Etsy shop is "Bee Happy." She's perfect for Valentine's Day. Her perplexed, little face just may be my own expression of late. 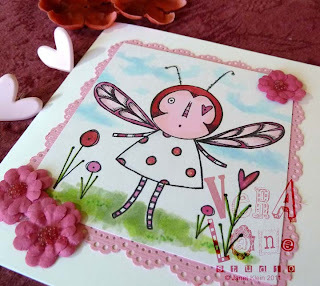 The versatile side-kick images are two different flowers which are great to use with or without Bee or to even incorporate with your rubber images to give new life. The heart and circle flowers come in PNG format, so you can overlap them and tuck them neatly under other images without the chunky, white outline box that the jpegs sport. Oh, life is calling me. Have to run. Until next time, be well, bee happy. 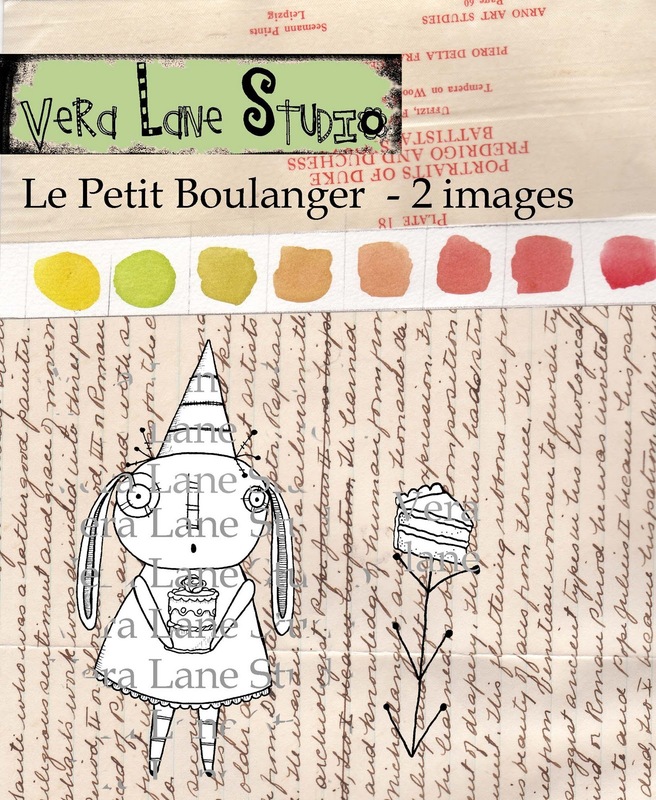 © Vera Lane Studio 2011. Awesome Inc. theme. Theme images by Jason Morrow. Powered by Blogger.